Braces have many positive benefits, especially for children and teens. If your child or teen has crooked teeth it can make cleaning them properly an issue, which can lead to tooth decay. Not to mention your child or teen could take a hit on their confidence with crooked teeth. Luckily modern orthodontics offers an abundance of treatment options that are relatively painless and provide a healthy smile and proper jaw alignment. The most common practice for fixing crooked teeth or a mis-aligned jaw are traditional braces. Newer technology has also allowed for clear braces as well, which make the braces almost invisible from distances. 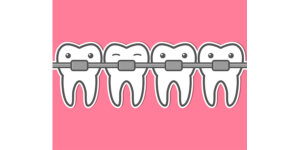 Braces consist of three different elements; brackets, archwire and ligature elastics (or rubber bands). Brackets are bonded to the teeth with a specialized glue and remain on the teeth for the entire time your child will have braces. Archwire is the wire you see that is attached to the brackets, these put pressure on the teeth to from to the desired direction. The elastics are what keeps the archwires in place with the brackets. These can be many different colors and are usually adjusted at each visit. These are your classic braces that we all know and love. Traditional braces consist of bracket and wires, however technology has advanced quite rapidly over the years making them much more effective than the traditional braces of the past. The design has changed quite a bit as well. Smaller brackets lead to much less noticeable braces and new technology allows for less discomfort and less time having to have braces. The same size and shape of traditional braces, ceramic or clear braces provide an even more discrete option for braces. They also feature tooth colored or white wires that allow them to blend in even further. While not every situation will require appliances, some patients may need these to compliment the braces. Special circumstances that would necessitate additional orthodontic appliances are; overbite, underbite, crossbite, difference in growth on upper and lower jaw, and a narrow upper arch. Appliances can be anything from a spacer in the roof of your child’s mouth to headgear worn at night to encourage proper jaw positions. Just like with all oral issues, every child is different. That’s why it is important to take your child for a consultation as young as age 7. At ABC Dental Peabody, we offer free consultations with no commitment to start treatment. Our Dentists will provide a complete consultation and provide a customized plan for treatment to ensure your child get the perfect treatment. At ABC Dental we accept Mass Health, along with many other insurance options to better accommodate families of Peabody and surrounding Massachusetts towns. So when is it a good idea to start the consultation for potential orthodontic treatments? If your child or teen is experiencing any of these symptoms and you believe it will be a good time to set up a consultation with ABC Dental Peabody, fill out the contact form on this page or give us a call at (978) 532-2227.